Grilled Dills - A recipe from Savor California, the online showcase for extraordinary gourmet foods and beverages from California. Drain the pickles, reserving the juice. Cut the onion into wedges and marinate them in the pickle juice for half an hour or more. 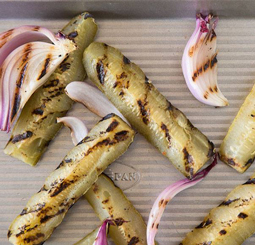 Grill the pickle and onion wedges.